Does your Kapex cut like this? New Kapex, new blades. The saw cuts straight but not very flat. I cut a piece of poplar and did a light pencil rub so the issue can be seen clearly and trust me you can feel it too. 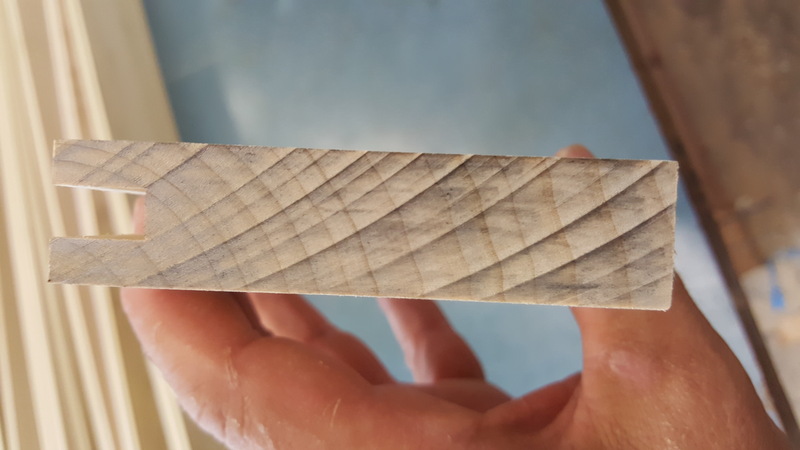 This is a problem when the final cut is visible and sanding endgrain is no fun. I don't know if this is related but the motor kinda "growls" intermittently while running. I noticed the same thing when I bought the Festool track saw a few years back: Festool motors just dont sound or feel very smooth while running. Bad bearings, bent blade, bent tooth on blade etc. are all possibilities. Just because it's new doesn't mean there can't be an issue. I've only got 2 Festool tools and neither has any motor noise issues. I'd take it back form wherever you bought it as there should not be any "growling" noise. Festool motors "growl" because of the speed control feedback circuitry. But it shouldn't cut like that. Should be glass smooth. It could be as simple as a bad blade or as complex as something wrong with the system. They have a great return or warranty program. You paid a lot for it, use it. Thanks for the comments. Leo G, I figured as much with the noise but thought it was worth mentioning. To the comments concerning blade issues, etc., the saw has been thoroughly tested using multiple new blades and checked for runnout. Really just wanting feedback from other Kapex owners to better understand what I should accept as normal performance. If it does the same thing with multiple new blades then I'd be looking for bad bearings. Checking run out turning a blade by hand may not show vibration in a blade at cutting rpm speed. Another possibility is a cocked mounting head. That is the blade is angled to the side when cutting. You can check this my measuring the thickness of the kerf on a partial cut and making sure it matches the blade thickness. Im not completely sure what is meant by heeling, but I think you're referring to the same thing as B.H.Davis. I dont think thats the problem. All three blades that have been used during testing came in the same shipment, stacked on top of one another. Maybe all three are slightly bent. I'm going to purchase one more off the shelf just to be sure. Yes, I didn't see that post. Seems the most likely cause and most easily fixed. It would seem appropriate to call Fst and email them the pic., particularly since I am understanding this to be a new saw, without my adding to the answers. No, mine is clear sharp no such burn. I had a Festool Kapex for four years. After only a couple months I had sent it in for repair as it was shattering pieces off the right side of the blade. They claimed there wasn't anything wrong with it and that they didn't do anything to it, yet when I got it back it shattered pieces off the left side of the blade. Four years after purchasing it one day it started smoking while cutting a 1x4. I sent it in and got word back from the company that it would cost $700 to repair it. I directly asked if they felt that was a fair deal for the cost I invested in it. It was never run off extension chords and only plugged directly into their vaccum. Their response was no that wasn't a fair deal. Now that saw sits in the garbage. Last dollar I will spend on that company. I loved their ideas and their tools but not their service!